Tuna as a dish always has a special taste and aroma. Cooked with spices, tuna can be combined well with anything, including bread as the combination. This tuna bread will wake up your spirit and dance the tongues of food lovers. Sauté the shallots until they are fragranced and add the chilies, Kecap Bango and water. Let them be dry slowly and add tuna chunk. Mix them well and add other ingredients. Before taking the sautéed filling, sprinkle the flour to thicken the filling. Mix all dry ingredients and pour the water and margarine and also the egg yolks. Mix and knead them well until they are getting smooth and not sticky anymore. Set aside the dough on the table for 15 minutes. Weight the dough about 50 grams and form it into a ball. The, set aside the dough again for 15 minutes. 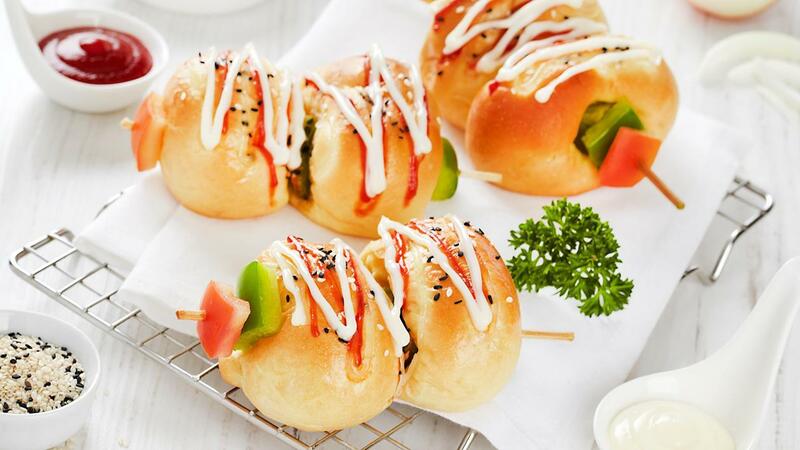 Divide the dough into two and fill the dough with spicy tuna and skewer it with satay skewer. Then, in the sidelines of the dough, add the red and green paprika that have been diced. Put it into a proving box until it is getting expand and ready to bake. Next, smear it with evaporated milk. After that, add Best Food Mayo Magic and tomato sauce as the garnish on top and bake it at 180°C.